The Eye of the Needle Pose is a gentle hip opening pose, that can be used as an alternative for the deeper hip openers in Yin Yoga, like the Sleeping Swan Pose, Shoelace Pose, or Square Pose. However, it is truly a pose unto itself. Whenever you find yourself unable to perform a strong hip opening pose, the Eye of the Needle is the pose to turn to! If you are a yoga teacher and find that one of your students are unable to the more intense hip opening poses, offer them them the Eye of the Needle as a modification! 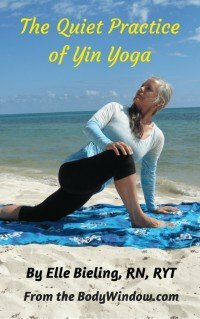 It is a more gentle hip opening pose, but still carries the same benefits as the more intense ones. If you have sciatica, this pose, is perhaps the single most important pose to relieve it! This is another amazing benefit of this most simple pose. The Eye of the Needle Pose is not specifically a Yin Yoga pose, according to the Yin Yoga experts, so it does not have a name just for the Yin Yoga practice. However, this pose easily lends itself to the yin yoga techniques. Please read specifically about how Yin Yoga differs, when you go to my page, "What is Yin Yoga?" This will give you a solid background on the subject. I love Yin Yoga, because in my experience there is nothing to balance and deepen your personal yoga practice more! Lie down on your mat or carpet with your knees bent and pointing toward the ceiling. Center yourself by becoming conscious of your breathing. Notice your breath for about a minute or so. You may feel a slight pull on your left hip. If you don't, it will be safe to take this pose deeper, because you are able to tolerate the external rotation of your hip. If you do feel an appropriate pull that is only mildly uncomfortable, stay in this position for the length of the pose, from 3-5 minutes on this side. If this starting position is too intense in your hip, slide your right foot farther out, straightening your right leg more (not shown), until you find a spot that you can comfortably hold, with a milder sensation. This is your pose. If you hold it for a minute or so and you find your hip opening and releasing, slide your right foot back up, to where you feel more of a pull again. When you do a Yin Yoga pose, try to use as little muscle effort as possible. Instead, relax your abdomen, shoulders, head and neck as much as you can. The sensations of the pose is targeted on the hip, not the abdomen, neck or shoulders. Avoid crunching up with your abdomen. If after performing the second step of the Eye of the Needle pose in the second picture, you find that you have even more room in your hip, you can take your hands and thread them through your legs even farther, to grasp your right shin, like pictured below. Don't forget to also work on the opposite, right hip, by crossing your right leg! It will be interesting to notice when you switch your legs, how the open hip feels different from the one you have not worked on. Then, when you go into the opposite side, notice if this side is harder to open than the other. Most often, this is the case, that you are not entirely balanced! Hold the opposite side for 3-5 minutes, the same amount that you did on the other side, so that you work on both sides equally. Remember, that when you are performing a yoga pose in the Yin style, that you are exerting no effort of the muscles. Relax everything except the muscles that are required to hold the pose, and then soften those muscles as well for the minimum possible exertion. The target area, in this pose is the hip joint. The long, slow holding of the pose, with a total release of the surrounding muscles allows for the deeper stretch of the joints, tendons, ligaments and fascia. This type of work allows for the deeper opening for a more lubricated and functional joint. A joint that moves into the future in a more adaptive and youthful state. A joint that is free of immobility and therefore injury! The Eye of the Needle Pose is one of self-acupressure on the Gallbladder and Liver meridians. Stimulating these meridians are very important for the health of your emotions, muscles and tendons. Finally, with the length of the yin pose, you can work on your inner methods of meditation, including breath work. Finding an even, balanced breath is the first step for more advanced forms of pranayama, or breath work. Take this time to go inward and concentrate on your breath. When your mind wanders with thoughts for the future or the past, return your attention to your breath. If you can stay focused on only your breath for a full 3-5 minutes while you hold a pose, you are mastering the art of meditation and are staying in the present moment! When this happens, a whole new world of insight becomes a possibility! If you add intent for healing through belly breathing, even more health can be yours. May your Yin Yoga practice be enhanced by the gentle, hip opening Eye of the Needle Pose! May you always be in the moment, body, mind and soul!